Remember, when you’re rebasing you’re rewriting history, so I would not advice to do this on a shared branch or on commits that you’ve already pushed to a remote. I only use this on local commits and branches that I haven’t pushed to a remote. I’m only going to talk about pick, reword, edit, squash and fixup. These are the most common ones. The exec option is for power users. 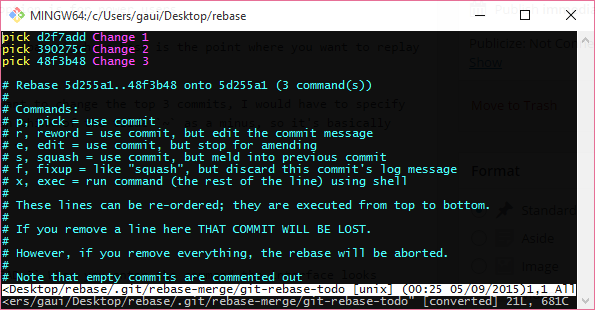 To start off, the command is git rebase -i <base> where base is the point where you want to replay your commits on to. So if I have the following commits and I want to change the top 3 commits, I would have to specify 5d255a1 as the base, or HEAD~3. You can think of the tilde ~ as a minus, so it’s basically HEAD minus 3 – which would be 5d255a1. Notice when you specify a command for each commit, you don’t have to write the whole word (e.g. pick), you can just specify p.
So let’s dive into the commands. This is the default option for commits when you enter interactive rebase. This means that you want to replay/use this commit as it is. If I don’t want to pick a certain commit, I would just delete the line. This allows you to change commit messages of commits. 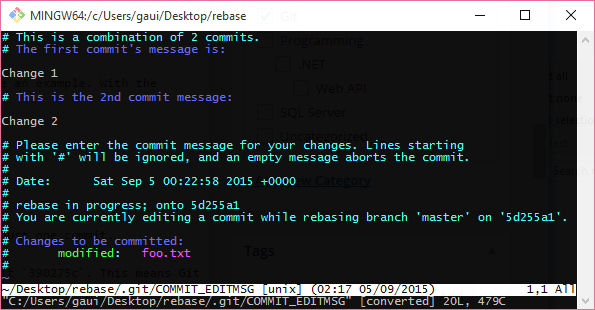 But take in notice, by changing the commit message Git needs to re-create the commit (with a new hash). Because Git doesn’t change the old commit, it re-creates it and allows you to specify a new commit message for the new commit. Take a look at the top two commits, they both have changed. Change 2 now has a new commit message: Change 2 - EDIT and a new hash bce9b79 (was 390275c). But the commit for Change 3 has the same commit message but a new hash fd0bfcd (was 48f3b48). Why is that? Because like I said before, Git created a new commit for Change 2 and because Change 2 is the parent commit of Change 3 it had to create a new commit for Change 3 which points to the re-created Change 2 – EDIT commit. Because we decided to change the commit message of 390275c (Change 2) Git needed to re-create that commit (now bce9b79). 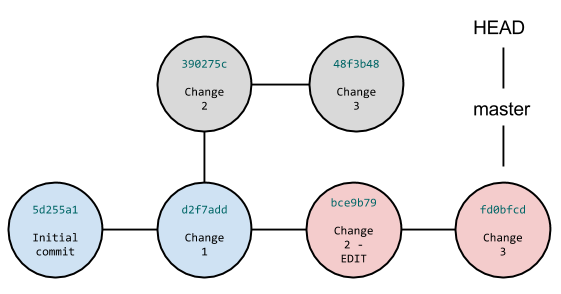 Also because the parent of 48f3b48 (old Change 3) was 390275c (old Change 2) Git also needed to re-create that commit (now fd0bfcd) so its parent would point to the new re-created commit for Change 2 – EDIT (bce9b79). The important part to know is that the old commits still exist. They’re just not in scope because the commit chain changed. master now points to the new commit fd0bfcd, which points to the new commit bce9b79, which points to d2f7add, which points to 5d255a1. Then again, if we would point master back to 48f3b48 (original Change 3) the history would be the same as the original. This is why Git is awesome. It’s just pointers which you can move around. This allows you to replay commits, but when you reach the commit which is marked as edit, you tell Git to stop there so you can change that commit. Not only can you change the message, but the content in the commit itself. 390275c (Change 2) only holds change where I added Line 2 to foo.txt. Let’s say I want to add a new file, bar.txt. That’s not a problem. Enter git rebase -i HEAD~3 and type e or edit infront of commit 390275c. To make sure I’m located on 390275c (Change 2) we can type git log --decorate and you can see that the HEAD pointer points to 390275c. Now if we check our commit history, we notice Git has created two new commits, 7689b9a and 5c56862. The same happened as in the reword chapter. Git re-created the commit for Change 2 - NEW FILE because as I said before, Git doesn’t change commits, it re-creates them and points them to the old parent. Like before, the old commits still exist. They just aren’t in scope, because the commit chain has changed. I want to combine d2f7add (Change 1) and 390275c (Change 2) into just one commit. Enter git rebase -i HEAD~3 and type s or squash infront of commit 390275c. 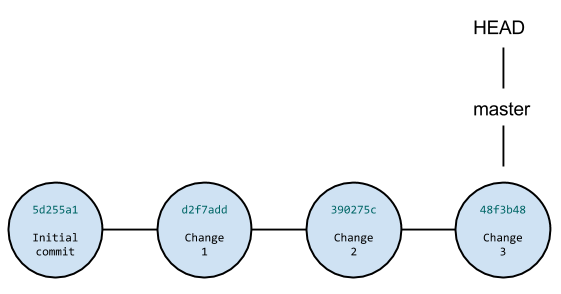 This means Git will meld 390275c (Change 2) into the previous commit – which is d2f7add (Change 1). The same happened as in the reword and edit chapters. 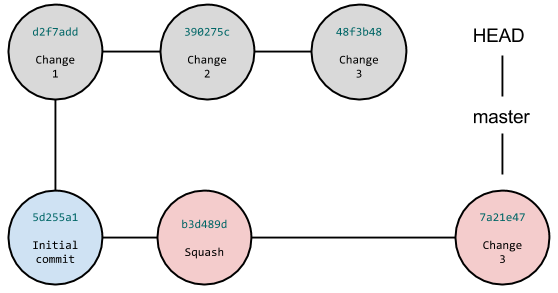 Git created a new commit where the changes from d2f7add (Change 1) and 390275c (Change 2) were combined into b3d489d (Squash). It also created a new commit for Change 3 because the old one was attached to the old Change 2. As I said before, Git doesn’t change commits, it creates new ones and re-arranges pointers. This is exactly like squash but it discards the commit message of the commits you mark with fixup, so it uses the commit message of the commit you squash into. Enter git rebase -i HEAD~3 and type f or fixup infront of commit 390275c. This means Git will meld 390275c (Change 2) into the previous commit – which is d2f7add (Change 1) and keeps the commit message of Change 1. Interactive rebase is a very powerful tool if you would like to clean up your history, by re-arranging commits, rewording them, editing them or squashing them together. But be adviced, it rewrites history and creates new commits, so only do this to local commits and branches that you haven’t pushed to a remote.